Near Nowhere, Near Impossible : Regan Gentry. 'Near Nowhere, Near Impossible' is a body of work that investigates and artistically illustrates the history of the failed Mangapurua Discharged Soldier Settlement scheme 1917 – 1942. 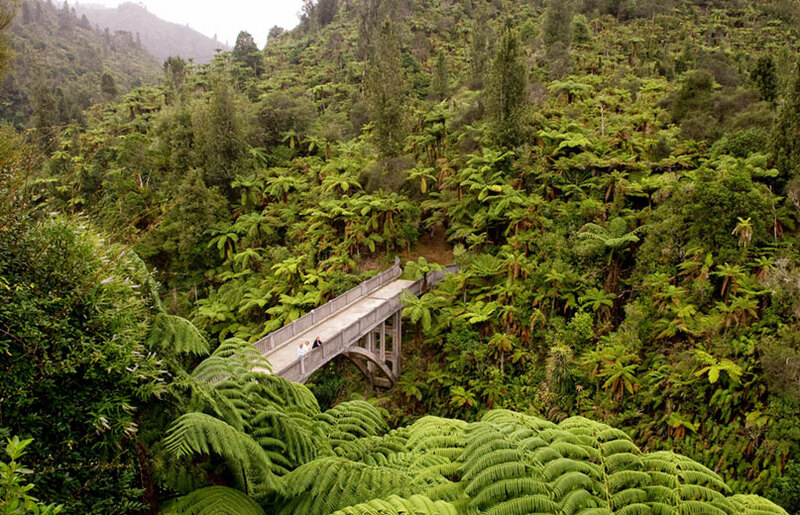 The ‘Bridge to Nowhere’, built in 1937 to service the Mangapurua valley, remains like some kind of monument to the scheme which was abandoned by the authorities five years later. This episode in New Zealand history illustrates the conflict between the resourcefulness and determination of New Zealand pioneers, with the unrelenting forces of the environment and world economy. Sarjeant Gallery, Wanganui. Curated by Greg Donson. Land productivity, property development and lifestyle choice were the driving forces behind the scheme – factors which are still as relevant today as they were a hundred years ago. The Discharged Soldier Resettlement scheme was initiated in 1915 with the best of intentions: one million hectares of land was leased or sold cheaply to 10,500 ex-servicemen to get the land working and producing primary products for export back to the motherland. 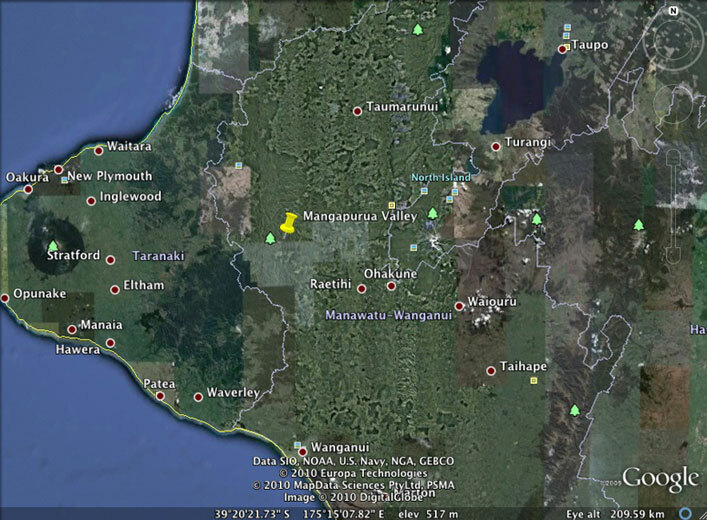 Around 40 returned servicemen took up holdings on the 45,839 acres within Mangapurua Valley on offer from the Crown. The scheme failed for a number of reasons: an untimely property boom led to overcapitalising on holdings; exports slumped; the settlers were often inexperienced in farming and had poor understanding of land management (the Department of Science and Industrial Research wasn’t established until 1926); the land was marginal and prone to slips; weather was inhospitable (seven major floods between 1931 – 42); there were issues with isolation and access and to cap it off, the advent of the Depression. Near Nowhere, Near Impossible - Greg Donson. ‘Near Nowhere, Near Impossible’ marks the conclusion of sculptor Regan Gentry's residency at Tylee Cottage from December 2007 - June 2008. Prior to taking up the residency, Gentry began to research the Mangapurua Valley, one of the remote valleys of the upper Whanganui River. 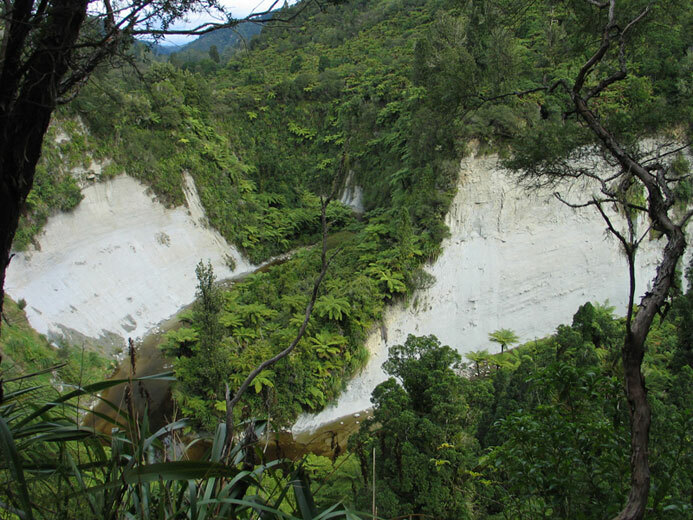 This valley is the site of the infamous 'Bridge to Nowhere', built across the Mangapurua Gorge in 1936 to service the valley as part of a planned road that would link Stratford to Raetihi. The Mangapurua Valley was opened up by the Government in 1917 for settlement by discharged servicemen from WW1 (1914-18). The road through was completed twelve years later in 1929, and then in 1942, after a series of destructive floods, the government officially closed the treacherous access road and ordered the last two remaining settler families out of the valley. Almost forty keen soldiers and their families had set out to establish farms in the valley. In text it is hard to convey the remoteness of this vast area. Anyone who has travelled the Whanganui River knows the enormity of the landscape; for those unfamiliar with it, imagine stepping off a boat into oblivion and perhaps you might be getting close. Of course the young men who settled there would have seen promise, but it is amazing to think that when faced with such an isolated valley of endless, bush-covered hill country with innumerable bluffs, that they still thought it a viable option. With the promise of government grants for improvements to the land the returned servicemen had the opportunity to make a new life for themselves in the backblocks. On arrival, each settler had to find their allotted farm and then set to work clearing the bush, before introducing pasture or stock. Initially, the settlers lived in tents and shacks before eventually building modest houses. The access road into the valley was slowly pushed through this dense bush and carved from the enormous papa cliffs that were continually slipping. The distance between farms in the valley was also great, sometimes taking hours on foot or by horse to reach the nearest neighbour. A song from the Mangapurua Country Women's Institute (est.1934) reflects the settlers' optimism. the Institute keeps us all happy and gay. We all keep smiling and don't get the pip. It is this optimistic outlook and grim determination that held Gentry's attention. What is so compelling about the settlement of the valley is that despite the 'nowhereness' of the place, these people stayed to try and make things work. The great Depression hit as productivity was rising in the valley. Many of the settlers had no financial option but to stay and endure the hard times. Today, the bridge that came too late, a few solitary brick chimneys, feral fruit trees and towering pines are the only signs left of habitation; nature has rapidly resettled and hidden the valley again. As with Gentry's previous residency in Invercargill as the William Hodges Fellow, where he produced a body of work from Gorse wood entitled ‘Of Gorse Of Course’, he spent a lot of time researching before embarking on the project. This included reading The Bridge to Nowhere – The ill-fated Mangapurua Settlement by the late Wanganui historian Arthur P. Bates and other texts about the area. Reading about a place or an idea is never enough for Gentry - he has to visit, absorb and experience his subject in a physical sense. For ‘Near Nowhere, Near Impossible’ he made three trips into the isolated and rugged valley on foot and bicycle. He approaches each new body of work by stockpiling ideas and materials, spending time with them physically and mentally and then moving forward with a plan of execution to bring the works into being. Objects are wrestled from raw materials, a virtual re-working of a found universe, to create works that are surprising, often humorous and always engaging. If you could imagine Gentry's brainstorm at the beginning of the Tylee Cottage residency it probably would have contained the following key words: bridge, rope, meat, thistles, toetoe, papa clay, chimney, bath, remoteness, bush, claustrophobia, vertigo, isolation, failure, dirt and the sound of water. Each one of these words can be found in the final exhibition, often in unlikely combinations. Materials are most often found - his work springs from a world of things or ideas that have been overlooked or used before. Inherent risk of failure through use of unconventional materials is something that has been a consistent feature of Gentry's artistic practice. But like a settler determined to make the best use of his land he works away with a steely determination to source materials, explore their properties and then force a sign language between his hands and the form. The completed body of work in the exhibition oscillates between those that required hard labour and experimentation to achieve the final result and those that were more immediate in their execution and arrangement. 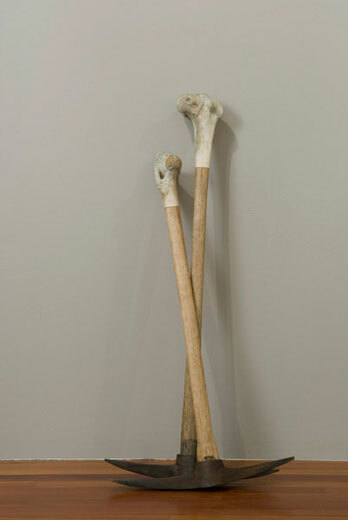 The End of the Tether is the most ambitious and physically engulfing work in the exhibition. 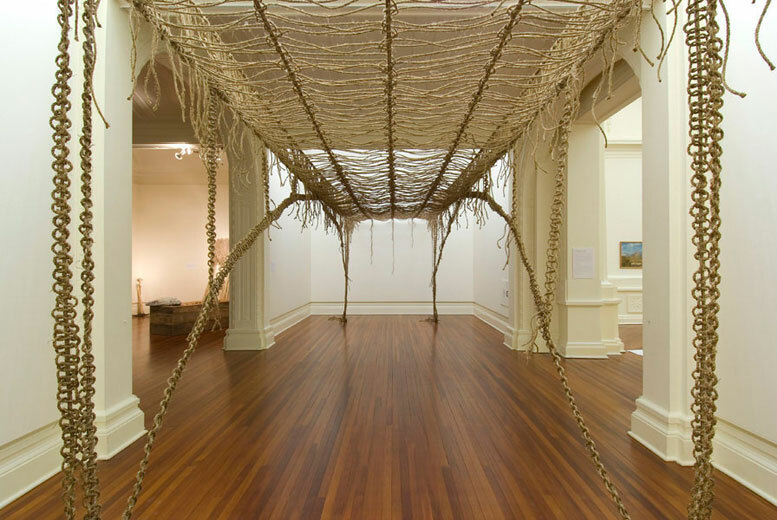 A replica of the bridge that spans the lower Mangapurua Gorge is constructed not from faux concrete but a hairy four kilometres of manila rope, hand knotted macrame-style and suspended like a giant string game across the gallery. Officially opening in 1936 the ‘Bridge to Nowhere’ came too late for many of the settlers, nineteen years after the valley was opened up for settlement. Even when the bridge was built it went nowhere. 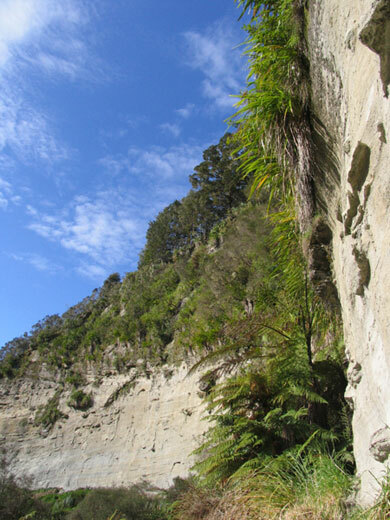 A vehicle was driven across on opening day only to reach the other side and turn around, as the bridle track down to the Whanganui River was still too narrow for vehicles. Not much of a celebration: rather like a swimming pool without water. The isolation of the valley and difficulty of getting supplies forced residents to be fairly creative with what they had to hand; the women of the valley embroidered flour and sugar bags to make everything from clothes to curtains and floor rugs. 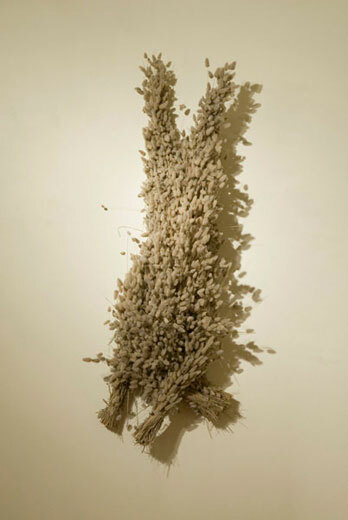 In the making of this work, Gentry takes a coarse material and creates something quietly elaborate and beautiful. The bridge spans two spaces of the gallery and like the actual 'Bridge to Nowhere', a birds eye view is not possible, obscured here not by the physical terrain of the valley but by the creamy walls of the gallery. A distinct feeling of enclosure and claustrophobia is also conveyed in this work. 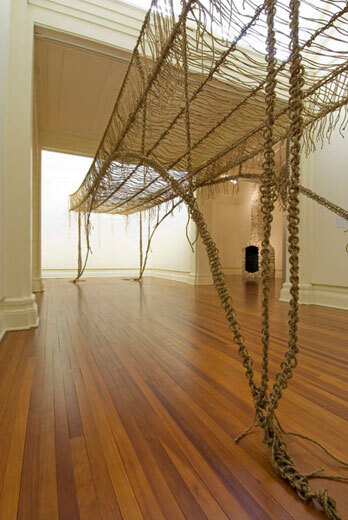 Logistically complex the flimsy bridge creates a tension with the building, engulfing the space and threatening to implode the gallery walls under the weight of the rope. The valley certainly took the settlers to the end of their tether, exhausting their patience and resources. The concrete bridge is more a symbol of the valley closing down than opening up. Prior to this the gorge could only be crossed via a perilous wire and timber suspension bridge, and was used not only for humans but stock, horses and any building materials that were needed in the valley. A few ruined chimneys are all that remain in the Mangapurua Valley as poignant reminders of the domestic home fires that were constantly burning. Although there is no evidence of pumice being used in the valley, it was commonly used as a building material around that time to build chimneys and also in the construction of cold stores. Like the Mangapurua settlers who had to make the most of the limited resources they had, Gentry has used a material that was at hand, abundant and sourced from local beaches to produce a larger-than-life dormant chimney entitled Cold Comfort. 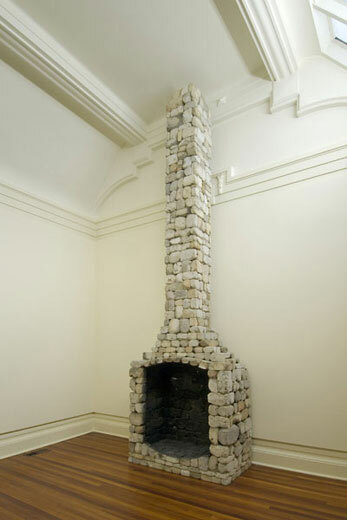 Conveying the erosion of home comforts, the towering chimney induces a feeling of vertigo, similar to that experienced when traversing the vast papa cliff faces found in the valley. Each piece of pumice used in the work was collected from the beach at the Whanganui river mouth, hauled home, cut down into a block and then pieced together like a giant jigsaw. Cold Comfort, along with other works in the show, has a ghosting feeling, wherein there are signs of human presence, but clearly no one is at home in these spaces. 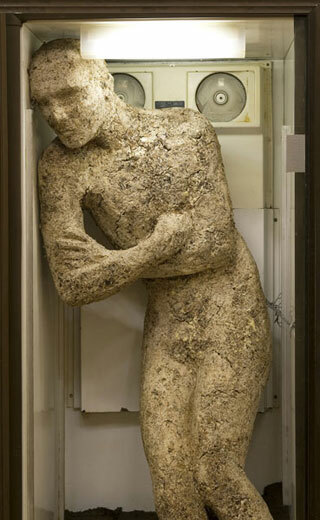 There is, however, one occupant of the gallery, a life-sized farmer jammed uncomfortably in a grotty fridge. Though vast amounts of supplies were brought into the valley, the settlers’ menu was fairly limited given the lack of capacity to store or cook food. In the early years often only a couple of supply deliveries were made per year. Tinned corned beef and potato bread were dietary staples. In this work entitled A Guts Full, Gentry confronts us with a figure made out of tinned corned beef, looking as though he's uncovered the remains of a mummified farmer in the bush and brought him home. The phrases "you are what you eat" and "stewing in your own juices" ring true with this work. The rawness of the slumped figure, full of useless fat and little muscle is indicative of the settlers' mental and physical exhaustion. The valley community had to constantly request additional support from the government, be this financial assistance or through the continual maintenance of the access road. By the end of the 1930s most of the settlers had left the valley, having had a gut’s full of trying to make a life and a living in a very inhospitable environment. The mental image that kept the settlers focused was the bales of wool they'd be sending to town and the cheques in return. 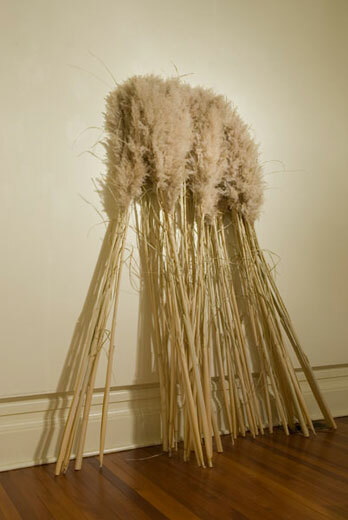 Gentry translates these visions into two wall-based sheep entitled Counting Chickens which are made from natural materials that visually resemble wool - toetoe and rabbits tails. Like searching for shapes in the clouds the viewer has to use their imagination. Gentry's interest in word play is particularly evident in these two works. Everything gets mixed up - animals, plants and body parts. It's a work about sheep but Gentry calls on the phrase "don't count your chickens before they've hatched" and uncannily even uses materials that reference body parts. 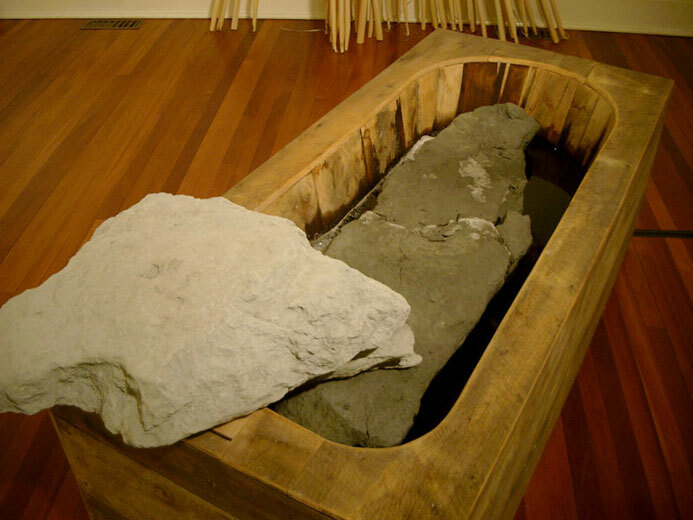 Fine at First is a wooden bath, modelled after a tub made by one of the second wave of settlers who arrived in the valley after some of the first wave had abandoned their holdings. The bath is occupied by a giant slab of papa clay soaking in black water that suggests how the Mangapurua Stream would have looked after it was clogged up with the burnt stumps and sooty residue from land clearing burn-offs. Mangapurua means 'plenty of water', but Gentry found when visiting the valley that he could often hear water trickling or babbling, but usually couldn't reach the source. 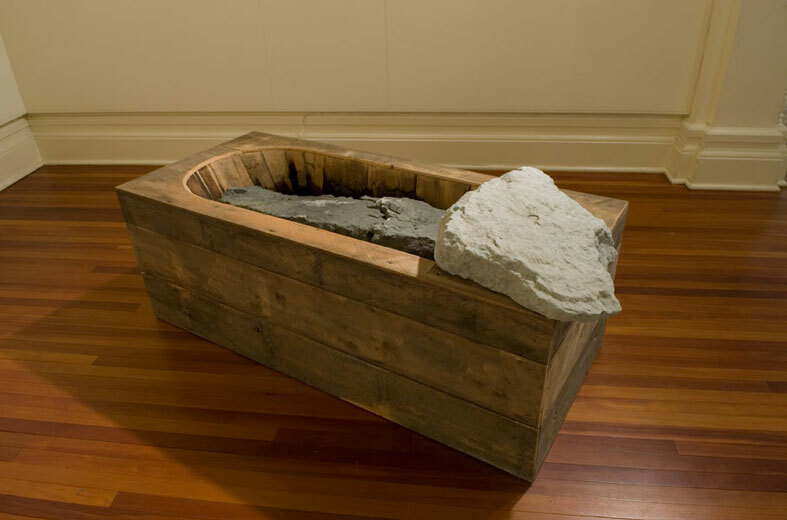 Like A Guts Full, this work is unnerving because again a human presence is implied, we expect to see someone in the bath but all we encounter is a hard slab of clay. The occupant has left the room with the water running and nature has moved in. The title is taken from the ominious daily weather reporting phrase and reflects settlers’ experiences in the ill-fated valley. “Fine at First” seemed to be the general experience, and it wasn't for want of trying for a sunny disposition and positive outlook. The bad weather and fog of failure constantly shrouded the valley and their lives. Over the last few years Regan Gentry has specialised in creating place and site specific works that respond to historically significant interactions between humans and the New Zealand landscape. 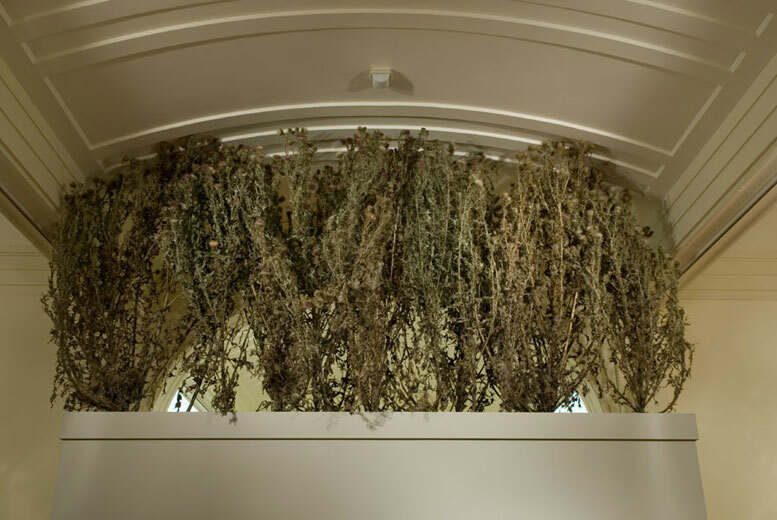 'Of Gorse of Course' successfully chronicled the spread of the now ubiquitious pest, and this exhibition empathises with the equally inevitable failure of settlers to colonise the wild and inhospitable Mangapurua Valley. Gentry's practice takes and tests failure in a broad sense, making the most out of awkward combinations. An anarchic alchemist of odd materials, Gentry has gently shown us human failure by selecting elements of New Zealand's history that haven’t quite gone to plan. The introduction of gorse into New Zealand and spending twenty-five year's worth of effort to unsuccessfully settle the remote Mangapurua Valley are hardly episodes to celebrate in New Zealand’s history. However, failure and mistakes are as much a part of ‘nation building’ as success, and Gentry’s work allows us to visually revisit history and review them within the context of current times. 'Near Nowhere, Near Impossible' is a body of work that responds to this intriguing part of history from the Whanganui region, a story that has all but been forgotten.